Uttar Pradesh Madhyamika Siksha Parishad(UPMSP) has released the list of UP Board exam centers fixed by them in every city of Uttar Pradesh. The candidates of UPMSP board can now check the exam centers allotted to them in their cities. Class 10th and Class 12th UP Board exam centers list 2019 is available in this article candidates can download it to check their class 10th And Intermediate Exam Centres of 2019. Students of board 10th and 12th of UP have filled their examination form in their schools and those forms were submitted at Uttar Pradesh Madhyamik Siksha Parishad in Allahabad. after that, the UPMSP Center List 2019 has started preparing for the exam center locating process. Now the process is completed and UP Board Exam Center List 2019 has been released by the board so that school authorities and students can check the exam centers and be aware of their exam locations. The centers will be same for a particular school for class 10th and 12th. There are some changes made. The examination centers are changed for certain school. school authorities can check it and can tell their students. The UP Board Exam Center List 2019 came out basically includes the school names, school areas, the capacity of sitting etc. There are certain girls schools also so keeping that thing in mind center locations are decided. The UP Board Center List 2018 Allahabad Region is fixed for all 75 cities of UP state. Within some days exam timetable will also be out. students of intermediate and 10th will get help with the timetable and they will be able to make study plans. 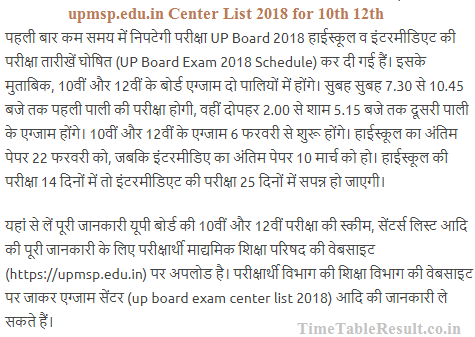 upmsp.edu.in Exam Center List 2019 pdf link is mentioned above in front of the particular area. The link will be opened by a simple click. When students will click on the exam center link they will be able to see all the school wise list of centers that the UPMSP has shortlisted for exams. NOTE: इस पेज पर आपने उत्तर प्रदेश बोर्ड की क्लास 10th व 12th से सम्बंधित सभी स्कूलों का नाम व अन्य जानकारिया ली हैं! यूपी बोर्ड के एग्जाम सेन्टर से समबंधित या अन्य कोई जानकारी के लिए आप निचे कमेंट कर सकते हैं! Scroll down the page and search “UP Board Exam Center List 2019”. Click on the UPMSP 10th and 12th Exam Centre List Link and check the table carefully. Select your area and click on the pdf download link mentioned in front of the area. Once Pdf will be downloaded you will be able to see the exam center. वो तो आप एडमिट कार्ड आने बाद ही देख सकते हैं की कौन सा सेंटर आया हैं! Click here and you get each and every information about the UP board 10th and 12th exam 2018.
ha wo to admit card pe milenge. Mahamna madan mohan inter college sanket mochan Lanka varanasi ka inter ka center kaha gya hai?? Sir pdf download nhi ho raha…. hame barabanki district ki 90% se above ki list see karni hai jo top 50 me ho. School name sant kabir inter college chachaipar mau. UP Board Exam 2019: The Uttar Pradesh Deputy Chief Minister Dinesh Sharma has released the detailed examination schedule of UP Board Class 10 and Class 12 Board Exam 2019. S. K. M. I. C.